One of the main reason shooters buy steel-cased ammo is the price. For shooters who want to get the most value out of their range ammunition but aren't interested in reloading their spent casings, this .223 Rem steel-cased ammo by Tula is a great option. This 1000-round bulk case consists of 50 boxes containing 20 rounds of 223 Rem ammo each. Tula constructs these range cartridges using Berdan-primed steel casings that are polymer-coated, non-corrosive, and disposable. Tula tops each .223 Rem cartridge with a 55gr bi-metal full metal jacket (FMJ) projectile that has an approximate muzzle velocity of 3241 fps. The FMJ bullet is accurate, consistent, and easy to shoot. The lightweight projectiles are surprisingly powerful and will punch major holes in your targets. Tula Cartridge Works is a Russian-based company with over 130 years of manufacturing experience. Don't pass on a chance to stock up on this affordable .223 Rem ammo. Order your 1000-round bulk case today! Great ammo, haven't had a missfire. Its good for training purposes. Fired few hundred rounds with no issues or jams. Great price and fast delivery as always, plus a discount from TSP. Great products, super fast delivery! Nice balance of value and quality. Great for what it is! I shot this ammo through my Del-Ton AR-15. Great shooter, definitely worth the cost. Out of the couple hundred rounds that I fired I only had one failure to eject - due to the ejector actually breaking the rim off the cartridge. No big deal, stuck a rod down the barrel and got it out. Definitely going to keep buying this ammo until I shoot the barrel out of my AR! Great value and quick shipping! really never used this before, but at the range last sunday 1 -10 missfired, its just not reliable. Their was four different brands of guns at the demo, every one used our ammo and we did not have a single complaint. Only one jam and it was not the ammo, it was the gun itself. I think we will be selling a lot more or your ammo from our shop. Ok for plinkin! Great company bulkammo! Finding this instate business was great. Price was exceptional, shipping and handling was okay. Delivery was just a couple of days. My AR and I have been on the firing range and I am very pleased with the whole process. Best price I could find and the best customer service! Works great in my Wyndham Ar-15. No jams or problems thus far. great stuff no problems for me. Good buy for the BUCK! I have run this ammo through my slide fire AR with no trouble. NOT ONE JAM! My uncle has all ways warned me,don"t fall for a salesman review. I would spend a few more dollars and buy a brass round from Federal or another top tier manufacturer. I bought 1000 rounds for my H&K Sl8 rifle. It is extremely accurate without misfire or jam. I haven't seen misfires or jammed rounds with this ammo, but the round is tumbling and often hits the paper sideways at 60ft. I have no idea where the rounds are going at 200ft. A: Hi Andrew. At this time there are no restrictions in place that would keep you from ordering this steel cased ammo. Just make sure your range does not have prohibitions against magnetic ammo! Q: Our range does not allow steel core ammo to be fired at the metal targets. Will the steel/brass bi-metal jacket cause more harm to the metal targets than plain brass jacketed bullets? A: Hello Jax, Bi-metal jacketed projectiles will absolutely cause more damage to steel targets than copper jacketed projectiles will. Since there is still steel in the jacket of a bi-metal jacket, you will still experience pitting on the steel like you do with steel cored rounds. Q: Is this ammo lacquer coated? A: Hello Earl, Tula ammunition is all loaded using a polymer coated steel case. They no longer use any lacquer for coating on their ammunition. A: This 223 rifle ammo from Tula is loaded with non-corrosive ammunition components. These rounds are berdan primed and will not be suitable for reloading. 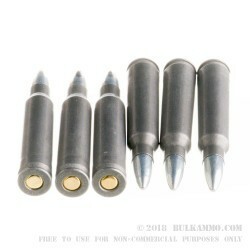 Q: are these Bi-Metal bullets. 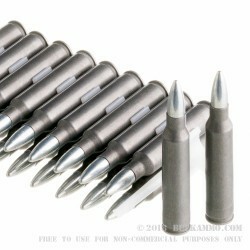 A: The bullets are composed of a bimetal material. This will cause the bullet to stick to a magnet. It is a good idea to check with your local indoor range for any types of ammo that may be restricted. Where allowed, this Tula ammo is a great choice for any target or practice application on the range. The bimetal jacket will not cause any premature wear on your barrel. These cartridges are also loaded with non corrosive components. Q: Steel case ammunition appears much less expensive than brass. I am looking for the best way to load up more bang for the buck but I don't want to sacrafice reliability. Is there a disadvantage in this regard? What disadvantages might there be with steel. A: For practice, plinking, and training, steel cased ammo is a great choice. It can't be reloaded and has little residual value, but allows the shooter to buy more ammo with less money. For defense and duty use, premium brass cased ammo is recommended. Q: Will this ammo work in a Ruger Mini-14? I've had some jamming problems in the past using some ammo. A: This ammo should be reliable in any firearm chambered for .223 Remington. A: The intense heat and pressure involved with the firing of a centerfire rifle cartridge will do far more to wear out your rifle than whether the case is brass or steel. Q: Does this manufacturer sell tracer rounds for .223 ammo? Thanks. A: No, to our knowledge, Tula does not make tracer ammo in .223.